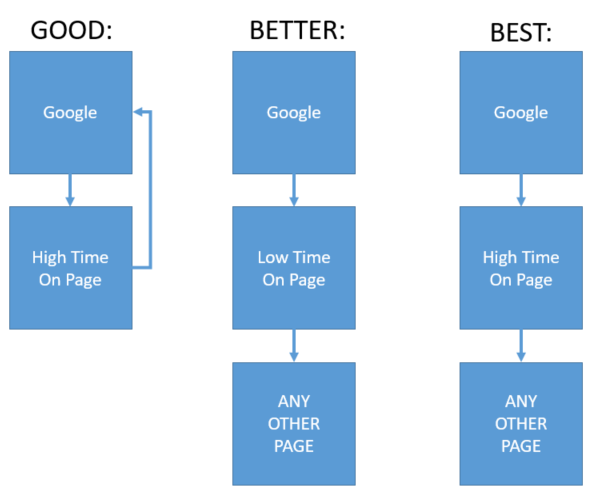 What if Google assigned a "content score" to every page on your website? Experts now think that's exactly what Google does. 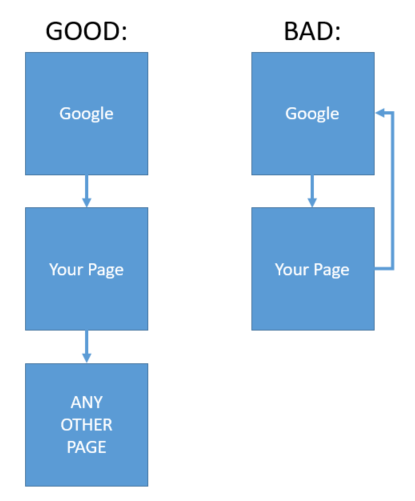 Every page, every post on your site gets assigned a numerical ranking. For simplicity's sake, let's assume that score is on a scale of 1-10, like the AdWords Quality Score. It makes sense. Google, the company that even scores people interviewing for a job, almost certainly rates every page on your site to determine where your page shows up in Google search results. To get more organic traffic to your site, then, you need to know the answer to this critical question: How do you improve your Google content score? We have analyzed hundreds of thousands of client pages on our content platform, and boiled the answer down to five metrics. Consider "actions" to be any action the user takes on your page, usually a click or a conversion. Focusing on a call to action is probably the most important thing you can do to improve your content score. Though you may think it's common sense to guide your readers into taking some action at the end of your article, most marketers apparently don't have common sense. The best-practice is to have a single, clear, irresistible call to action at the end of your article, just as this one does. Put yourself in Google's shoes: It just wants users to get the most relevant search results. We've all had the experience of doing a Google search, clicking the first result, then the second result, the third result, and finding them all useless. When we don't find what we're looking for, we leave the page. How often that happens to a page is called the "bounce rate," and it's been an important statistic that Google has tracked since the first release of Google Analytics. 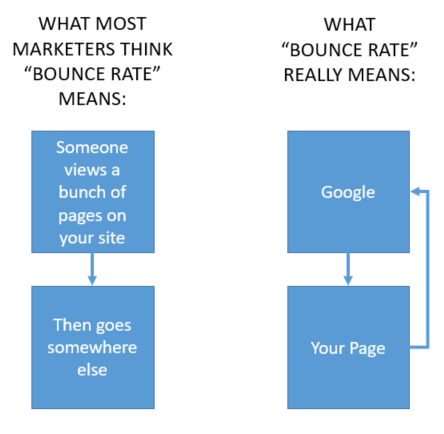 Most marketers misunderstand what bounce rate really is: It's the percentage of visitors who view only that one page on your site. In other words, it's only a "bounce" from Google's perspective. Someone searches, hits your page, then "bounces" back to Google. The most important thing for marketers, then, is to be sure you're not just engaging users, but giving them somewhere else to go. This article is about 1,000 words, and the average reading speed is about 200 words per minute. Let's imagine that most people spend about five minutes on this page: We'd be pretty happy with that result. Now let's imagine that people are spending about 15 seconds on this page, but the bounce rate is still low. That might indicate a lot of people are clicking a link at the top, so it says to Google that something is satisfying the user's search query, but probably not so much the page itself. The best scenario is high time on page, combined with low bounce rate: Your content is engaging people and convincing them to take action. 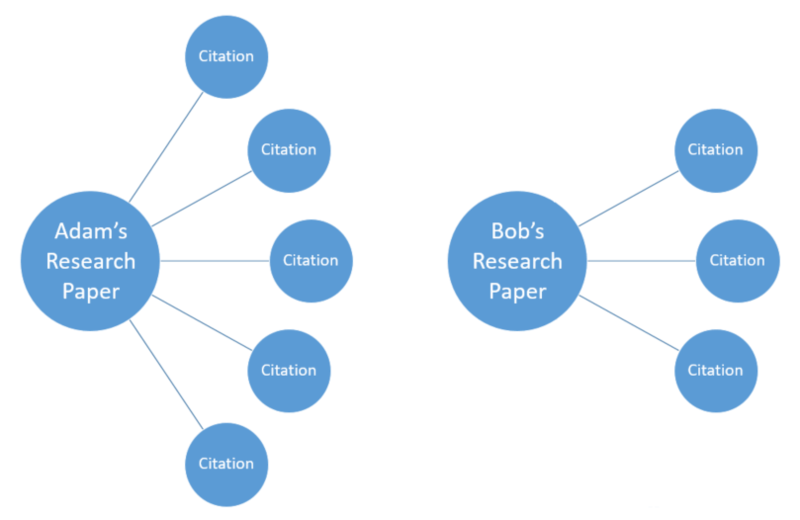 Imagine Adam has an academic research paper that's been cited by five other studies, whereas Bob's paper has been cited by only three. Clearly, Adam's paper has more academic merit (or at least Adam has better PR). That was the insight behind the original Google algorithm: More people pointing to your content means better content. Google's Andrey Lipattsev has confirmed as much: The two most important ranking factors, he says, are "content, and links pointing to your site." We've developed the 95/5 principle of content: After all the hard work on developing content for their blog, most marketers find that only 5% of their posts get ranked in Google and end up driving 95% of their traffic. 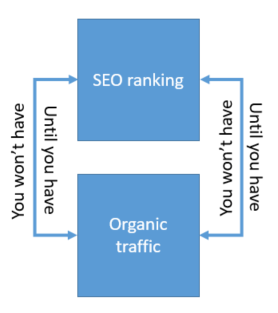 The challenge is that if you have strong SEO rankings, you get more traffic, but you won't get strong SEO rankings until you have more traffic. It's a hall of mirrors! The solution is to kickstart traffic with content promotion. If you'd like to score your own content, we have a free downloadable template. Using your own Google Analytics metrics, this spreadsheet will score your most valuable content pages so you can improve them further. It's been developed in conjunction with MIT-trained engineers... Click here to download our free content-scoring template. Media Shower is a content marketing platform that delivers results. Our intelligent software measures how customers are engaging with your existing website content, then recommends how to optimize your content to deliver more traffic, leads, and customers. And if you need content, we’ve got that, too. With a global team of thousands of experts, journalists, and editors, our team has helped brands like Intuit, Walmart, and Yahoo achieve better content marketing results. We can help you, too. Visit us at www.mediashower.com.